Growing up, Dad always made a gingerbread house for us at Christmas time. As we got older, he would build the house and I would decorate it. 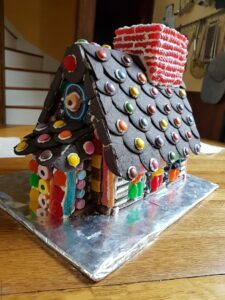 The idea was to cover it in candy to the point that no gingerbread was actually visible any more. We’ve kept up the tradition as well – here are a selection of the houses we’ve build and decorated (with the girls’ help of course) over the years.